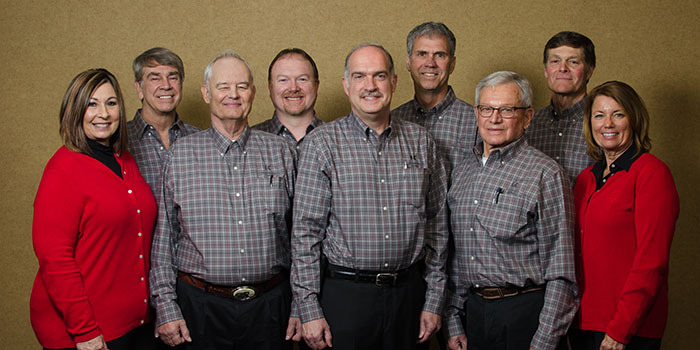 Pictured, from left, are board of director members Pam Messmore, Steve Miner, Bill Stump, Dan Tucker, John Hand, Tony Fleming, Terry Bouse, Rick Parker and Kim Buhrt. WARSAW — A crowd of over 1,700 Kosciusko REMC members and their families filled Warsaw Community Church on Saturday, April 13 for the electric cooperative’s 80th annual meeting. The primary item on the agenda was the election of directors. KREMC members re-elected Kim Buhrt, John Hand and Pam Messmore to serve three-year terms. Members enjoyed a hot breakfast catered by Jarrety’s Place of Rochester and original music written and performed by local musician, David Haney. KREMC also hosted an open coffee bar and a family area upstairs where members could enjoy breakfast with their kids and work on a building project together. Grant Reigner, KREMC’s applications system analyst, emceed the business meeting portion of the event which included a “question and answer” portion with KREMC President and CEO Bruce Goslee. The questions asked came from the members and included topics such as broadband, electric vehicles, and future rates. Goslee explained the importance of maintaining a clear right of way around power lines and KREMC power sources. KREMC announced three lucky sixth graders who were selected to attend Touchstone Energy Camp. Those students are Cannon Baist of Warsaw, Savannah King of Warsaw and Caleb Quiggle of Pierceton. KREMC also announced the two students selected to attend Indiana Youth Tour in June. Youth Tour is an excellent opportunity for high school students to take a trip to Washington D.C. to tour the capital and meet with elected officials. This year’s delegates are Katherine Ousley and Madison Dyck, both students are from Whitko High School. Six students were recipients of the John H. Anglin Memorial Scholarship. The selection of winning scholarships for 2019 was made by random drawing of names. The winning students each received a $1,000 scholarship for the upcoming year’s classes at the college or trade school of their choice. Winners of the John H. Anglin Memorial Scholarships are Austin Bowell, Warsaw Community High School; Miriam Hagg, Warsaw Community High School; Megan McQuade, Indiana Wesleyan University; Alivia May, Warsaw Community High School; Sarah Tucker, Tippecanoe Valley High School; and Olivia Bell, Indiana University Fort Wayne.